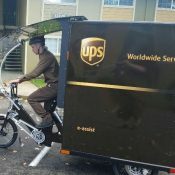 Remember the story we published back in November about UPS hiring bike delivery riders in the Oregon area? Since then, the riders have undergone training and now they’re out on the road helping UPS keep up with holiday shipping. That’s just great … UPS should consider doing this across all of North America. I live in a climate where getting your average cyclist to ride year round is just not going to happen (-25C w/ windchill is not most favourable cycling weather). It is also a university town, so finding cycle deliver folks for the other three seasons of the year should be fairly easy. That put a smile on my face. Nice video! VERY interesting to hear how far off the estimate was for how many packages a cyclist could deliver vs a driver in a truck. Great to see it in practice! Kudos to UPS. Surprised they don’t get some sort of cover for those packages. Also, would have been kind to have given the riders an electric stoker to help with hills (though I don’t know what Salem’s hills are like if any). Hey guys, thanks for checking out the video. The rider did have plastic bags to cover boxes for when it started to come down…don’t know how official they were, but half of the ride, they had to stay covered. Everyone be safe out in the weather! Beautiful video and such a great idea. A highest 5 to all involved. I wonder if the other drivers are delivering as much as Tina? She’s probably a little quicker then average. This is very cool! Way to go UPS. Way to go Tina! Great story. With that dark uniform on a dark day, Tina looked liked she should have been wearing a safety vest. That flag looked a little small. That’s something. Should be interesting to watch what UPS does with what they learn from this effort. If it saves money, a lot of people would probably love to do this work. I’m surprised the company doesn’t have a nice, big UPS patch on the back of her jacket. In the ‘couve, my stint with UPS has involved an apparently different kinda route, serving a cluster of large apartment complexes (Now with built-in StairMaster action!) and only a negligible number of house-on-street stops. Truck drops off at a rented garage and I fill up that garden cart and spiral out to each complex, one or two street addresses per trip, the kinda thing which drives the big van drivers nuts. Vancouver quickly came up with a tarp for the trailer box, plus there are standard issue plastic bags to cover packages. My biggest 4-5 hour day has been just over 60 packages (that was all they dropped for me – still more than local trainer expected), so Tina is really burnin’ up the bike there. The bike (Paul, I locked the shocks out first thing) and trailer (not a commercial-grade bicycle cargo trailer) were purchased with the view that this is an experiment for these participating warehouses (the local UPS base that stuff emanates from). Neither is ideal for bicycle delivery, but UPS deserves respect for a good effort, considering there is no company-wide guidance and no extant bike-mindset (at least, not in Clark County – but that’s the norm here, despite Pollard & Boulanger… don’t get me started). Regarding visibility, my group was provided chartreuse vests with Reflexite tape as a must-wear “uniform” element (although I have gotten away with my own bike-specific chartreuse rain jackets & vest). I received only that pull-over that Lisa is wearing, but it’s been left hanging as I’ve been wearing more see-me garments. The UPS supervisors have been pro-safety in every aspect, and they have also been very open to feedback from a vehicular cyclist in a space they have no prior experience in. Response from people to their UPS delivery arriving by bike has been consistently positive. Scuttlebutt is that the drivers [of the big brown vans, called “Package Cars”] love the bike thing, ’cause the start/stop, run up & down stairs action bites into their route times and the holiday season is the biggest crush all year. I’m hearing that locally there may not be enough work year-round to support the bike-helper positions as a normal part of operations, however, I wonder if that would be true in a serious metro environment like parts of inner Portland. By the end of last week, with all the snow on the ground, I was having a blast; I like riding in snow. Now, in the midst of the Snowpocalypse, when it might be even better (even less traffic than last week, plus deeper cover means I can use those bike chains I brought out at the first hint of snow), my dispatcher told me, “No helpers today” (Monday), and tomorrow doesn’t seem to be offering much change… Probably, the idea that bikes can operate in this current environment is just a little too far out for them. Yeah, European UPS uses bakfiets-ish cargo bikes and that would help here, too, besides something like a StokeMonkey. Other American cities are doin’ this successfully. If they can do it in Concord, NH, where it snows in earnest, we should definitely be able to pull it off here! I love it! And I wonder if UPS knows that they’ve got a thoroughbred doing clydesdale work…I’d be surprised if other delivery staff could keep up with Tina. Fabulous video–great work Mr. Lopez, and thanks Jonathan for sharing. A friend of mine and fellow cyclist out here in Hillsboro received a package by UPS bike. He was super excited and said the delivery person was a bit shy and surprised by his enthusiasm. Way cool. I hope other companies steal this idea, too.